Get more of the space you need to spread out, relax or work at the smoke-free Comfort Suites Foley-North Gulf Shores hotel in Foley, AL. Nearby activities and sites include the Alabama Gulf Coast Zoo, Waterville USA, Pirates Island Adventure Golf and the Tanger Outlets. 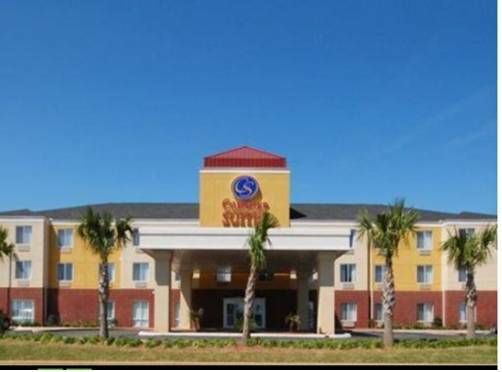 Enjoy free hot breakfast, free WiFi, a fitness center and guest laundry facilities. Your spacious suite offers 25 percent more space than the traditional room and amenities like a flat-screen TV, fridge, microwave and recharge device. We also offer membership to the Choice Privileges Program, which gives members the opportunity to earn valuable rewards points toward airline miles, gift cards and free hotel room nights. 100.00 USD deposit required for cash paying guests. Hotel reserves the right to charge your card upon booking a reservation. Declined card may result in canceled reservation without notice. Holds are placed on all cards 72 hours before arrival in the amount of stay plus incidentals. Holds release after 5 to 7 business days post check-out, longer at card issuer discretion. Fees may apply to all early check-ins and early departures. All Comfort Suites are Smoke Free. Fee for Smoking is 250.00. 1 Adult, over 21 years old required in each room. Please do not request connecting rooms.